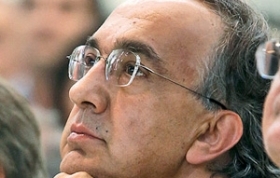 Marchionne will present a new plan in May. TURIN (Reuters) -- With a new strategy focused on relaunching its Alfa Romeo and Maserati brands, Fiat Chrysler could raise its annual production capacity to between 6 million and 7 million vehicles, although the target may be difficult to reach, CEO Sergio Marchionne said. "With the new industrial plan we have the possibility to produce between 6-7 million vehicles a year, but I'm not sure we will get there," Marchionne told Fiat's annual shareholders' meeting in Turin today. The company shipped 4.4 million vehicles last year. Marchionne did not give a timeline for the target, but the new industrial plan, which will be presented in early May and will outline all new models and investments, is expected to have a duration of 3-5 years. Fiat told shareholders to expect plenty of good news as the completion of a full merger with U.S. unit Chrysler opens greater global opportunities for the world's seventh-largest carmaker. The creation of Fiat Chrysler Automobiles (FCA) after Fiat took full control of the third-largest U.S. automaker in January in a $4.35 billion deal paves the way for Fiat to easily and cheaply share technology, cash and dealer networks with Chrysler. "The birth of FCA will end the precarious life of Fiat," Chairman John Elkann told shareholders. "Today for the first time we have different prospects: we no longer need to play a game of survival ... you can expect much good news in the future." Marchionne reiterated the group's forecast of a 2014 trading profit of between 3.6 billion euros ($5 billion) and 4.0 billion on revenue of around 93 billion. Worldwide group shipments are expected to rise to between 4.5 and 4.6 million vehicles, up from 4.4 million the previous year, he said. Marchionne said the growth in shipments will be largely driven by higher volumes in North America and Asia-Pacific. Fiat expects its new strategy focusing on exports of premium brands such as Maserati and Alfa Romeo to help override some of the weak demand in its traditional markets, especially Italy, hit by a six-year slump in car sales in Europe. Fiat Chrysler Automobiles - formal creation of which is still subject to a shareholder vote - will have its primary listing in New York, with a secondary listing in Milan. The holding group will be registered in the Netherlands and have its tax domicile in Britain, cementing a politically sensitive shift away from Italy, Fiat's home for the last 115 years. Marchionne has said he expected to finalize the merger and the move of the merged group's primary listing before the end of the year. Unions and politicians have been concerned about any potential job cuts but Fiat said the merger would have no impact on jobs in Italy or elsewhere.